Oak Meadow Blank Journals (50 pages) are perfect for note-taking, sketches, observations, or for writing thoughts, ideas, questions, and dreams. 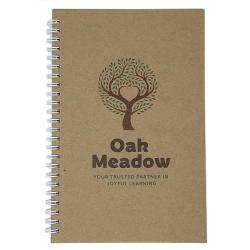 This blank, unlined journal is used as a reader’s journal and field journal in several Oak Meadow high school courses. Spiral bound with recycled paper pages and recycled chipboard covers, 6 x 8.5 inches.